After a night out at Target Field watching the Twins get badly beaten, we awoke to a very temperate Summer Saturday in Minneapolis. It was one of those days where you don’t sweat but you’re plenty warm in a T-shirt and shorts … a rarity in Minnesota’s August climate. But the day offered a great opportunity to avoid the crowds at the State Fair and head to an affair of the culinary delight: Mill City Farmers Market. Since our move back to the Midwest, we’ve relished the days to be a tourist in our native lands. Saturday provided an even level of excitement and relaxation at the market. About three-times the size of most I’ve been to (Stillwater, Lakewood’s Belmar and Denver’s LoHi), Mill City’s gathering included multiple vegetable gardeners, organic butchers (pork, beef, lamb, buffalo) and natural crafts from rugs and pottery to soaps and holistic healing. There were even mini donuts. We shared an organic pork sausage breakfast sandwich on croissant bread with a gorgeous view of the Stone Arch Bridge, and enjoyed the company of other Twin Citians soaking in the mild heat and buzz of eating and buying local. 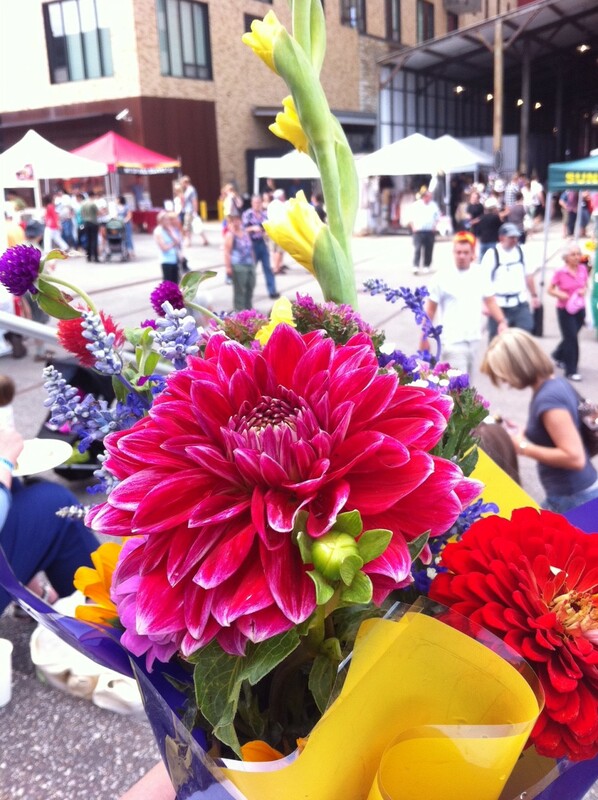 The Mill City Farmers Market is open rain or shine on the outdoor Chicago Mall between the Guthrie Theatre and spoonriver restaurant, and in the historic train shed of the Mill City Museum. The market overlooks the mighty Mississippi River. It runs from 8 a.m. to 1 p.m. Saturdays, through October 15. And the table will be dressed with a beautiful and very reasonably priced bouquet of dahlias and wild flowers.